Pocket e-Sword is not being developed or supported. How do I view Pocket e-Sword modules? 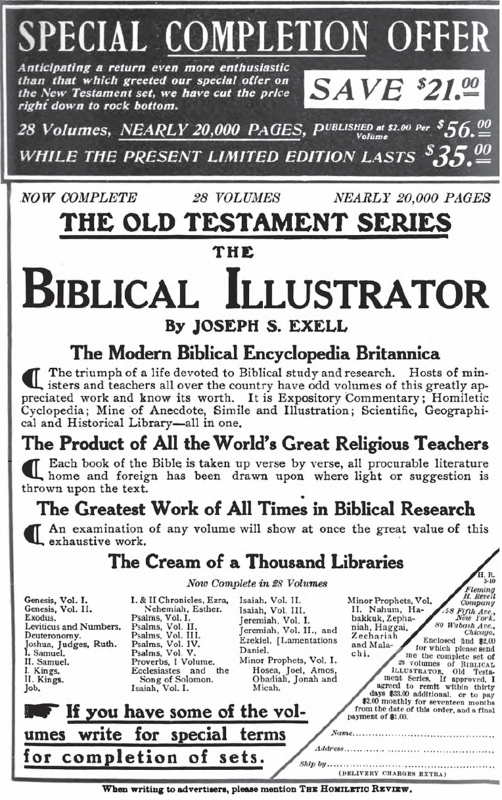 Joseph S. Exell edited and compiled the 56 volume Biblical Illustrator commentary. You will recognize him as the co-editor of the famous Pulpit Commentary (this commentary is even larger than the Pulpit Commentary). This remarkable work is the triumph of a life devoted to Biblical research and study. Assisted by a small army of students, the Exell draws on the rich stores of great minds since the beginning of New Testament times. for nearly every verse in the Bible. This massive commentary was originally intended for preachers needing help with sermon preperation (because who else in that day had time to wade through such a lengthy commentary?). But today, the Biblical Illustrator provides life application, illumination, inspiriation, doctrine, devotion, and practical content for all who teach, preach, and study the Bible. and so many more (listing them all would fill your monitor screen many times over). The collection also includes lesser known authors published in periodicles and smaller publications popular in that ara. Unlike modern publishers, Exell was apparently not under any pressure to consolidate the number of pages. The nearly 35,000 pages of material resulted in the largest e-Sword commentary known to exist, at 190+ megabytes. While this commentary is not known for its Greek or Hebrew exposition, the New Testament includes hundreds of references to, and explanations of, Greek words. See John 4:46-54 for an example. Included are two newspaper advertisements (one from the Old Testament and one from the New Testament) to show you how this commentary was originally marketed. 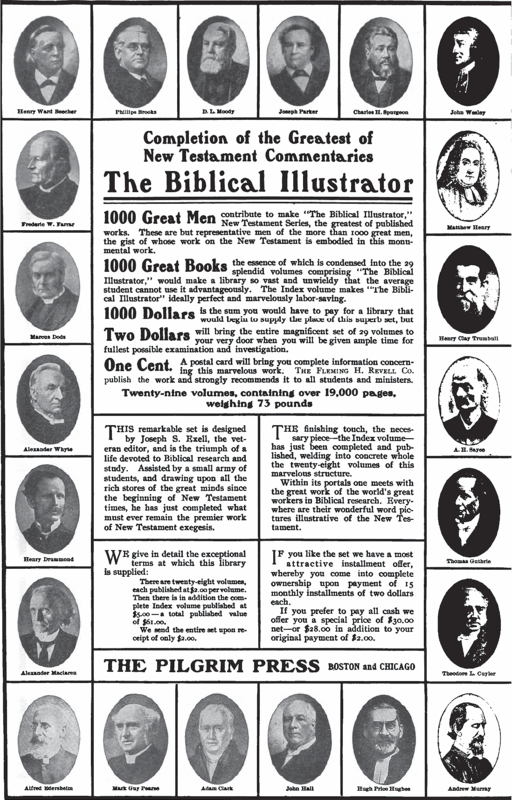 The NT ad is particularly interesting because it shows portraits of a number of the authors included. "No matter how full his library may be, nor how empty his pocket-book, the minister who sees this work will want it." — Observer. "It promises to be the most useful cyclopedia for ministers issued as yet." — Christian. in one, giving the results reached by many learned experts." — Methodist Review. "Mr. Exell here devotes more than 500 closely printed pages to one short epistle of six chapters. He has gathered together a vast quantity of sermonoutlines, anecdotes and illustrations of all kinds, intended to aid in the exposition of the Epistle to the Galatians. This kind of labour-saving apparatus ... is undoubtedly very popular at present, and, if wisely used, may be very serviceable, particularly to lay-preachers and Sunday-school teachers. If such work is to be attempted, it is at least carefully and well done by Mr. Exell. He has laid under contribution writers of all kinds, and inserts extracts of all sizes, sometimes consisting only of a line or two, sometimes extending to more than a page. The comments are judiciously chosen, generally from evangelical writers, and, for the most part, those of this century. The editor's preface, statement of faith on the Bible, his approach to Bible study and interpretation, the authencity of the Bible, and a general introduction to the Bible is shown separately in the topic file (also viewable by selecting Commentary > Info within e-Sword, but it's difficult to read). 12. Is the Bible God's Word?